Call Now, 15 min In & Out! Why Do Employers Drug Test? When are Drug Tests Conducted? There are a variety of circumstances for which an organization may require a drug test. What is a Chain of Custody? A chain-of-custody form is used to document the handling and storage of a sample from the time it is collected until the time it is disposed. It links an individual to his or her sample and is written proof of all that happens to the specimen while at the collection site and the laboratory. What is a Confirmation Test? A second, confirmation test (by gas chromatography/mass spectrometry or GC/MS) is highly accurate and provides specificity to help rule out any false positives (Non-Negatives) from the initial screen. For a test result to be reported as positive, the initial screen and confirmation test results must agree. What are the Collection Procedures and Protocol? What Types of Specimens Does ANY LAB TEST NOW Collect? Non-invasive specimens are collected (Urine and Hair). Urine is the most commonly used specimen for illicit drugs, reflecting SAMHSA’s guidelines. What Drugs Does ANY LAB TEST NOW Test For? What is Hair Drug testing? Hair testing is the most accurate and effective method of finding users of drugs of abuse and can detect drug use for the previous 90 days. Using a small sample of hair cut at the scalp, hair analysis evaluates the amount of drug metabolites embedded inside the hair shaft. How Long are Drugs in One’s System? Drugs have certain “detection windows”— which is the amount of time after ingestion that evidence of their use can be detected by a drug test. ANY LAB TEST NOW® can test your hair sample for unknown substance and drugs. An unknown poison and toxin analysis tests for unknown chemicals, poisons and toxins that include but are not limited to pesticides, organic exposure chemicals, painting or cleaning products, rodent poison, volatiles and inhalants. This analysis does not test for drugs or heavy metals. No two situations are alike, so contact ANY LAB TEST NOW® for assistance if you suspect poisoning or toxic exposure. Many employers find it useful to test both hair and urine for pre-employment purposes. Urine is useful for detecting recent or new drug use (last 1-3 days except Marijuana which is longer) and hair for providing an approximate three-month drug history. Can Hair testing be beaten? We have not found any adulterants that can beat the test at this time. Moreover, the risk is minimized because every collection is directly and easily observed. Bleaches, shampoos and external contaminants (i.e. marijuana smoke) have no known impact on test results. Our testing method measures the drug molecules embedded inside the hair shaft, eliminating external contamination as a source of a positive test result. Hair testing results cannot be altered with shampoos or other external chemicals. How are the hair samples collected? In order to be fair to the donor, we must have enough hair to repeat assays if necessary. 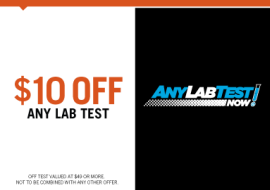 ANY LAB TEST NOW® may use head, chest, underarm, leg, or face hair for collection. ANY LAB TEST NOW takes Hair Follicle Test samples under strict Chain of Custody Procedures. The test can include third Party Medical Review Officer (MRO) verification. ANY LAB TEST NOW® hair drug test results are court defensible. Is Anonymous Hair Testing Possible? Yes, as with many other tests Hair Follicle Testing can be conducted anonymously. Can hair collected from a brush be used? Yes, the test will be reported as having an “anonymous” donor. All communications regarding your Drug Test results are confidential so you can be assured of your privacy.